This beautiful evergreen vine has glossy green leaves on stems to 9 m (30'). 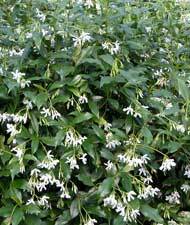 The 2.5 cm (1") clusters of very fragrant white flowers becoming cream are at their best on a sheltered warm sunny wall. Not quite as hardy as Asiaticum.